Day 50, Aberdour to Kinross. Back on the trail in "The Heart of Scotland" as we enter our third county since crossing the border. Day 51, Kinross to Methven (nr Perth). Phil & Helen join us as we start our penultimate week ~ it's mountain walking all the way from here and today we saw our first sight of the snow on the peaks ahead of us! Day 52, Methven to Aberfeldy (10 miles ahead of schedule - again!). Bless his little cotton hiking socks ~ Alan's trusted old walking shoes died suddenly today. 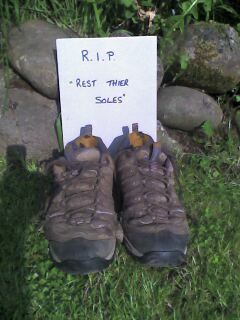 They passed away peacefully aged 850 miles doing what they loved best, faithfully serving their master on the hills. Sadly they went 10 miles in to a 21 mile day after a long a battle against being swamped by a combination of English & Scottish bog water but (hey) what a way for a walking shoe to go! Day 53, Abefeldy to Blair Atholl. I am so glad that I decided to lose some weight on this trip because the Scottish up's are a very long way up and the down's are a very long way down. Perhaps we should take the nice flat/straight A9 road? ~ NO ...this route is fun and the views & wildlife are just awesome!